EVOLUTION OF PLANTS. Bacteria originated in the oceans, then acquired the ability to use sunlight to synthesize complex molecules from CO2, releasing oxygen as a by-product. Oxygen was converted to ozone, shielding the earth from UV irradiation. 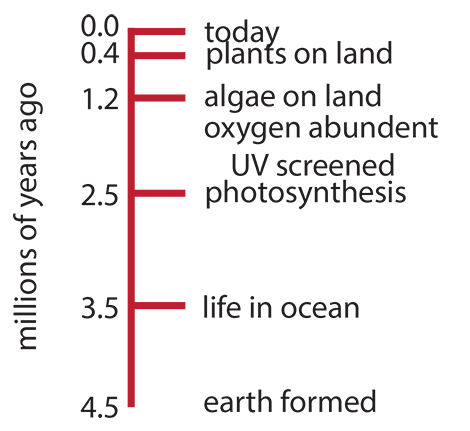 This allowed life to move to land about 0.4 billion (400 million) years ago. Since then some organisms have moved back to the ocean, e.g. whales and sea grasses. PROTECTION FROM SULFITES. 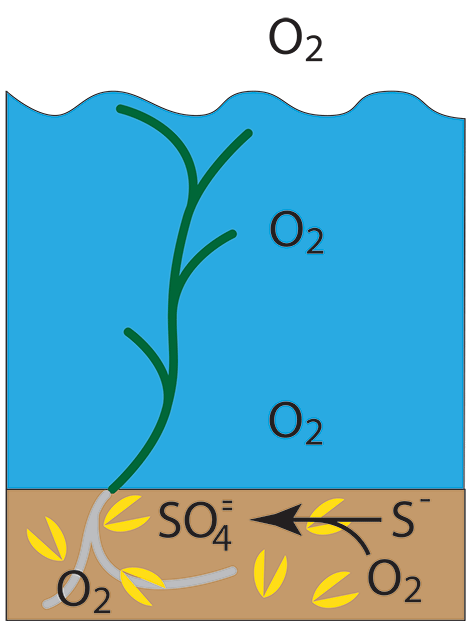 Mud bottom (light brown) and sea grass roots (grey) could be in a zone of high sulfite (S-) concentration because of the generally low oxygen (O2) concentration. However, bacteria living in the gills of clams (yellow) use oxygen supplied by the sea grass roots to oxidize sulfate to sulfate and reduce carbon compounds to sugars, which are used by the clams. ANIMALS THAT CLEAN SEAGRASS LEAVES. top: side view of isopod on eel grass leaf. middle: top view of the same isopod. bottom: Taylor's hare, a mollusk on an eel grass leaf. This month's essay was motivated by the article in Science: "A Three-Stage Symbiosis Forms the Foundation of Seagrass Ecosystems" , (also see introduction ). In addition to the symbiosis described in Science, I present at the end of this essay an additional symbiotic system involving seagrass. This second system is illustrated with my own photos. Seagrass does not actually live "On the Dock", but instead lives in mud, 2 - 6 m under the Dock. It is most dense in the middle of shallow Richardson Bay, several hundred meters out from the Dock. However, as mentioned many time in LOTD, marine organisms are constantly moving from the Dock into the water, and arriving on the Dock from the water. It's all one neighborhood. First of all, seagrass is not seaweed. Seaweed is the common name for large algae (visible by eye); photosynthetic organisms that live in the ocean. On the other hand, seagrasses are land plants that have evolved to live in the ocean. They are thus similar to marine mammals, e.g. whales; land animals that have evolved to live in the ocean. In both cases the evolution has been from ocean to land, and then back to the ocean. The seagrass that grows near the Dock is eel grass, or Zostera marina. It is a angiosperm, a plant with a seed that is part of a flower. The flower and its seeds break off the plant body, float on the water surface to a new location, and then sink to form a new plant. Typical of water near human populations, water the Dock floats in has a very high concentration of nutrients. The solid organic materials (dead plants, sewage, trash) sinks to the bottom. The soluble material (fertilizer runoff, sewage plant discharge) stimulates growth of algae which grows to high concentrations and then dies and sinks to the bottom. Thus the bottom mud contains a large amount of organic material containing bacteria that often can't obtain sufficient oxygen to oxidize the material to CO2. They then do the best they can by reducing sulfur in the organic matter to sulfite (S-), concurrently oxidizing carbon compounds to obtain energy. The problem is that sulfite is toxic to seagrass roots. Seagrass transports oxygen from surface water down to its roots. It also produces oxygen by photosynthesis. This oxygen is used by bacteria living in the gills of small clams to oxidize sulfite to sulfate (which is not toxic). This is the discovery presented in the Science papers. It's thus a three part symbiosis: seagrass, clam, bacteria. Seagrass leaves are nice surfaces for bacteria and algae to live on. You can see them by eye as a light brown-green fuzz of the leaf. As long as this layer of epiphytes, analogous to the moss and lichen that grow on terrestrial trees, is not too thick, it's not a problem for the seagrass. However, seagrass is a plant, and needs sunlight to grow. Thus epiphytes that shade the leaf too much robs it of life. However, the bacteria and algae that live on the seagrass represent food to other animals, and I have photographed two species that live on the eel grass near the Dock. 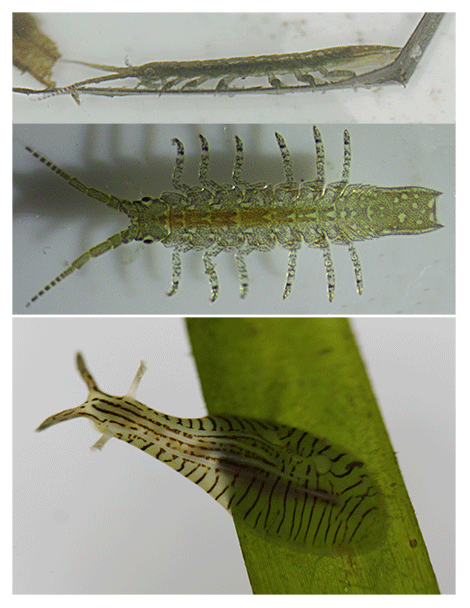 The top two photographs are side and top views of an isopod that cleans the leaves, while the bottom image shows a mollusk that does the same. Both of these animals do not harm the eel grass it self. However, when the leaves of the sea grass break off and die, these animals do eat the dying plants. The seagrass community is a rich and complex one which is essential for the biological productivity of shallow ocean waters. In this essay I have only described two symbiotic cycles of the many which hold the community together. The first is the clam-bacterial animal complex that detoxifies the sulfites produced by other bacteria in the mud that the seagrass is rooted in. The second is the collection of animals that browse on the seagrass leaves to maintain its exposure to sunlight. Seagrasses Partner with Clams to Stay Healthy. Science, 15 June, 2012, Vol 336 pg 1368. A Three-Stage Symbiosis Forms the Foundation of Seagrass Ecosystems. Science, 15 June, 2012, Vol 336 pg 1432. Unfortunately these articles are not "open access", so you must have a subscription to Science, or access to a library that has one, or wait 6 months after the publication date to get free Internet access.